Summary Judgement: In a story of less than five thousand words, Clarke balances the harder and softer elements of science fiction. The division between “hard” and “soft” science fiction is an interesting one. Most readers within the genre will agree that the terms work to describe the quality of the science proper within a given narrative. All too often, however, “hard” and “soft” act as polite euphemisms that create an artificial dividing line between “literary” and “mass market” science fiction. The unfortunate connotation therein is that the former is somehow more reputable than the latter. For various reasons that need not be detailed in this review, I disagree. In fact, I reject the very notion that the two are somehow mutually exclusive. 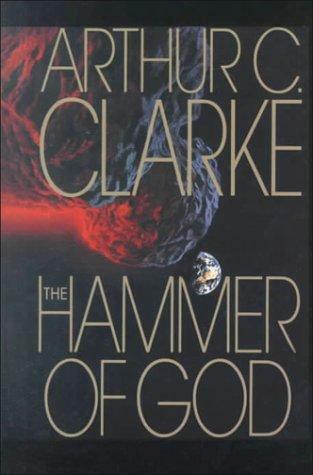 Sir Arthur C. Clarke’s reputation as a master of “hard” sci-fi is well earned, but his short story The Hammer of God can be seen as a bridge between the two subsets of the genre. Hammer is set within the same universe as Clarke’s 1962 masterpiece Rendezvous with Rama, though farther along in the timeline. Set in the early 23rd century, Hammer details a mission to deflect a planet-killing asteroid, aptly named Kali, from a collision with the Earth. The story is primarily told from the perspective of a SpaceForce captain named Robert Singh. Singh commands the orbital tug Goliath, and is charged with installing a rocket motor that, over the course of several months, will deflect Kali on to a safe trajectory. But that’s only half of the equation. I imagine no shortage of modern editors would look at some of the details that Clarke offers and ask that most dreaded of questions, “How does this advance the plot?” It’s a fair question as there is so much text that builds depth without actually forwarding the narrative. Do readers really need to know about the breakdown and fusion of Christianity and Islam to grasp the severity of a “Chrislam” extremist’s attempts to sabotage Goliath’s mission? Probably not. When an extinction level event is imminent, showing without telling is perfectly valid. However, it is in those possibly extraneous words that Hammer starts to read like something that is comparable to Heinlein’s Friday. The world nation that backs SpaceForce’s mission to map and patrol the solar system against rocks, comets and other space ephemera emerges out of a near-dystopia. Prior to the “Demilitarization of Earth”, Clarke crafts a world where private armies supplant gangs for control of Los Angeles’ streets. Prohibition in America leads to extensive trade wars. Bootleggers clash with Canadian “Medicops” in attempts to sneak Tobacco into the United States – a nation where “an estimated 20 million people died from ‘Smokey’”. Economic meltdowns see the “near simultaneous collapse of capitalism and communism.” Order is restored through the World Bank’s chaos mathematicians installing a state regulated economy that ends cyclical boom and bust globalization, thus averting a much feared final depression – a plot point which should resonate with every contemporary reader. From the ashes of this mess a single world nation stabilizes humanity in a way that is infinitely more accessible than visions of the future that are dependent on cornucopia technology or alien intervention. Even conventional ideas of marriage give way to the normalization of polyamorous relationships and accompanying birth control legislation. Granted, much of these social changes are the result of terrestrial technological innovations. Yet, much like warp drive, mass relays and stargates, the science is wholly tangential and not subject to deep scrutiny. How then do the two balance each other? I mentioned earlier in this review that there’s no need to explain the society behind the Goliath’s mission. That point remains valid. What I strategically omitted is that if all these details were cut from what is ostensibly the main story, they would form a complete, but parallel, tale on their own. This tactic is simultaneously the defining characteristic and Achilles’ heel of this story. Hammer could work quite well as a strictly space based “hard” sci-fi story. Clarke’s decision to include the parallel narrative takes the abstract premise of the “Earth at stake”, and turns it into a tangible place within the reader’s mind. Of course, this decision assumes that the reader wants a heightened level of detail. If they don’t, the story turns into a bloated belly flop. Absent objections to extra depth, Hammer is a wonderful success for balancing the harder and softer elements of science fiction in under five thousand words. 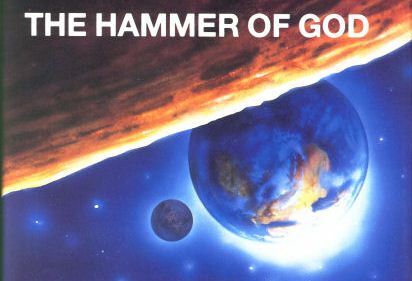 The Hammer of God did in 1992 what many other contemporary sci-fi/spec-fic writers are doing now. It ignored the idea that the social sciences ought to be alienated from the physical sciences within genre literature. Some publishers and purists might insist that the engineering of Dyson Spheres can not or should not coexist on the same page with applied social Darwinism. Despite those sort of objections, Hammer’s take away message is clear: science and sociology are parallel forces within the human equation. You can read The Hammer of God, for free, at Lightspeed Magazine.